I often reminisce about the good old days of my youth when I visited my grandparents on their farm in Moorefield, West Virginia. I lived in Middletown, Maryland, which was about two and a half-hours away from the farm. During my summer vacations I would spend two weeks helping granddad Wilmer with his farming duties. Wilmer and his brother Weldon owned the "Neff" farm. They were beef farmers from 1937 until their retirement. Raising Herefords was their main source of income. Harvesting corn, wheat, oats, and even green beans helped pay the bills as well. The farm consists of nearly 200 acres of "farm" land and roughly 190 acres of "wood" land. 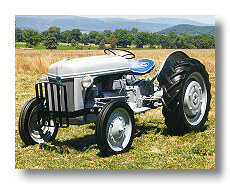 The Ford-Ferguson model 9N was the first tractor purchased for the Neff farm in 1940. As a youngster, supervised of course, my granddad would allow me to climb aboard the 9N. I would often ask him to take me for a tractor ride while sitting on his lap, which I soon outgrew. One of my fondest memories was when granddad gave me the opportunity to solo my first ride on the 9N. I was at a ripe old age of seven. Excited and scared, I passed the test, which involved the tractor strategically placed in the middle of a field with nothing to hit or run over. From that day on, you could not keep me away from that machine. 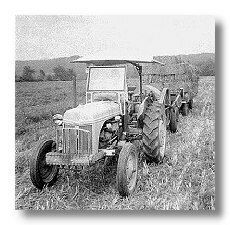 There were three tractors on the "Neff" farm, the Ford-Ferguson 9N, the Ford Golden Jubilee, and the Farmall A. My favorite will always be the 9N. It has a Sherman step-up auxiliary transmission and it could fly in third gear on the highway. The hard work took a toll on the 9N during its many years of service. 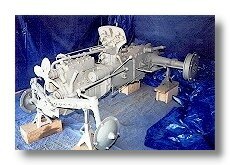 It underwent engine rebuilds, valve jobs, a paint job in 1955, along with other minor repairs. The 9N was like a "Timex" watch, it would take a licking and keep on ticking. The last repair my granddad performed on the 9N was an engine overhaul in the summer of 1985. Dad and I asked him why he put more money in this "tired dog". He wanted the 9N to outlast him and to be used on the farm when he was gone. Who would foresee that several months later he would develop lung cancer? Granddad etched his values into me and educated me about farm life. In July of 1986, my granddad, who I idolized, passed away. Shortly after his death the 9N quit running. 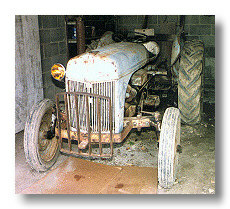 Granddad was the only mechanic on the farm and the only one that knew how to keep the machinery going. In 1986, I asked dad if I could have the "9N" to restore someday, and he agreed. At this time, there were 2 remaining tractors on the farm, the Jubilee and the 9N. Dad agreed to give the Jubilee to my grandpa's brother, Weldon, in exchange for the 9N. Chained to the Jubilee, the 9N was towed to a nearby shed where it spent the next ten years in hibernation and out of the weather. During that period, I would occasionally take a trip to the shed to reminisce about this sentimental piece of machinery. Each year of storage seemed to lessen a chance of restoration for the 9N. In the summer of 1996, something clicked inside of me. I finally got interested in the possibility of restoring the non-functioning 9N. My sweet, wonderful, grandmother was getting up in age. She's always been there for me and I wanted to do something to make her proud of me. With plenty of overtime available at work, the extra cash would come in handy. Motivation and money were all I needed to get started on my new project. Next I rigged the gas tank to be suspended over the motor. Now came the moment of truth. I turned the key on, pulled the choke, and pressed the starter button. After a couple of attempts, the motor fired and was running. I jumped for joy. Excited, I ran across the road to my grandmother's house and borrowed her cordless phone and ran back to the tractor. I called my dad who was about 125 miles away at the time. With dad on the line I fired up the 9N once more and he couldn't believe what he was hearing. This was the start of a long and tough road for me. What made it difficult was the tractor was 2-½ hrs away from where I live. So for the next year, I became a weekend warrior mechanic and the 9N became my life. It was difficult to figure out which broken up thing to work on first. I had to come up with some sort of strategy. First, I came up with a "plan of attack". I made a list of items that need fixed. 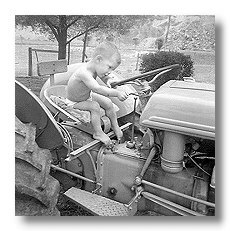 I worked on one area of the tractor at a time until I had everything in good working order. I repaired as many seals/gaskets that I thought was necessary. You don't want oil leaking all over your fresh new paint job. Second, my plan was to have my brother power wash the tractor. He owns and operates a power washing business called "Pressure Plus". This would remove all of the years of grease, grim, dirt, and loose paint and be easier for the sandblasting process. The third part consisted of sandblasting the entire tractor. I removed all sheet metal, wheels, and miscellaneous parts and blasted them separate from the chassis of the tractor. Take caution when sandblasting your tractor. Tape up all areas where sand could get into your drive train. The fourth part of the plan was painting. I decided to go with a two part painting process. I powder coated all of my sheet metal and miscellaneous parts. Only the chassis and rear wheels were wet paint. Powder paint produces a tough, durable finish. I had a powder coat sample made while my parts were powder coated. I used this sample to get a custom color wet paint to match the powder. I sprayed urethane enamel on top of epoxy primer to complete the job of painting the chassis and rear wheels. I also want to mention that I had the manifold and exhaust system sandblasted and painted with high temperature paint. This keeps the "rust" factor away from your beautiful paint job. On July 3rd 1997, after the painting was completed, I set out to put everything back together. This was my favorite part of the restoration and it took me better part of a day to complete the task. I was thrilled when the 9N fired up after tightening the last bolt. I also videotaped and took many pictures as I went along. I have learned a great deal restoring this sentimental piece of machinery. When I first started, the idea was to make "Old Betsy" functional around the farm. As the project progressed, I saw "Old Betsy" in a new light. I use the tractor mainly for a few parades and a couple of antique tractor shows every year. I owe a great deal to my grand parents. They taught me so much about the values of life. I restored this tractor to make my grandmother proud of me. I wish my grandfather were alive to see my efforts. I did feel as though his was right there with me while I was restoring the 9N. I have a magnetic sign that I hang on the front bumper that reads "Dedicated to Wilmer and Ruth Neff", my grandparents.